A startling testimony by an end-time prophecy student of how the Lord has led him systematically in a marathon prophecy research and how divine revelation drove him to formulate an end-time prophecy course that exposes a covert end-time religious agenda for the reintroduction of global idolatry. ALMOST NO ONE IS WARNING YOU ABOUT IT! 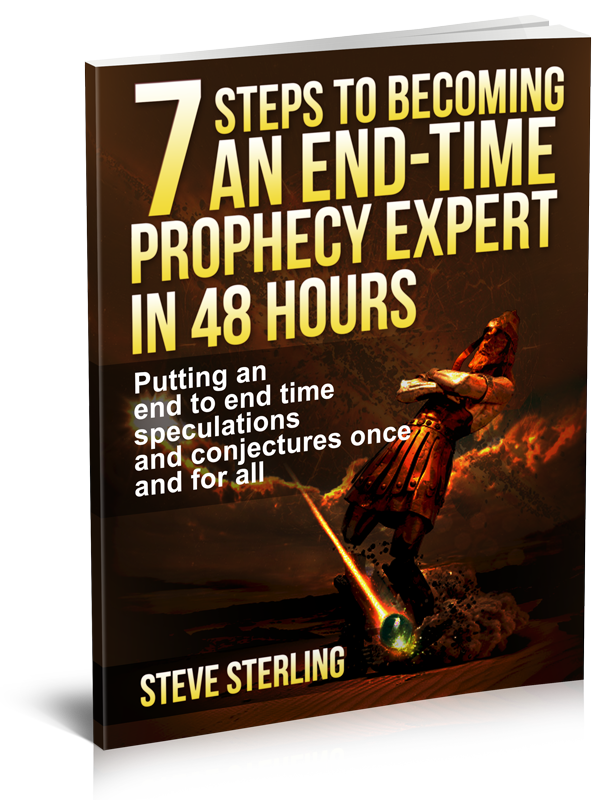 I am Steve Sterling, author of the End-time Prophecy E-course and a student of Bible prophecy for over 25 years. What I am about to share with you in this material is going to revolutionize the way you view end-time prophecy. This is not another “Y2K” prank. And far from another “Antichrist” false alarm. You are about to discover one the most startling end-time truths in Bible prophecy that the Lord has ever revealed. What I‟m going to tell you is not something you have ever heard before. You never heard your pastor preaching about this … it is not the kind of stuff you would hear at any of those big-tent crusades or from any of your favorite prophecy experts on TBN, 3ABN, or even on YouTube. In other words, if you download this document expecting to get more of the same old arguments you have been hearing over the years in your Sabbath/Sunday school, prepare to be shocked! If all I‟m here to tell you are things you‟ve been hearing all along then there would be no point in me putting out this information for end-time prophecy enthusiasts like you, who are eager for the truth, to download it. And depending on how open you are to a new way of thinking you are either going to be astounded by what I am going to disclose, or be disappointed and end up deleting this ebook from your hard drive. This is not going to be your normal prophecy info! So if you„re there wondering whether I am merely attempting to reinvent the wheel with empty claims about “new truths”, that‟s ok. Skepticism is not always a bad thing. After all, there are so many different views on the internet you don‟t know what to believe and who‟s telling the truth. However, before you set off your “false prophet‟ alarm bells and raise your “charlatan” red flags it is very important that you read this entire document – all the way to the very end – because what I am going to share with you is quite simple. I am not here to impress you with stories about some “mystical” encounter with all the bells and whistles of an Ezekiel vision, neither am I seeking an opportunity to stuff my religious views down your throat (there is no need for that). Nevertheless, I trust you are a honest seeker after truth who is willing to travel the road that religious bigots and ignoramuses are not prepared to tread. And the mere fact that you have chosen to download this PDF file to your computer (or mobile device) is positive indication you are at least open to biblical perspectives other than what you have already heard. almost overnight and I‟m sure you will at least identify with what I‟m going to say when you hear the whole story. In fact, it is not so much about a particular doctrine as it is about a particular principle … a principle of which just about every prophecy student is very much aware but seems to forget completely! Yet, this is largely what makes this end-time discovery such an intriguing breakthrough. There was a time in my experience as a Bible student when I thought I have heard it all and known just about everything there is to be known about last day events. But just when I thought I could have given myself the pat on the shoulder for my more than twenty years of experience in prophecy studies I was suddenly awaken to the shocking reality that the real prophecy study has just begun! It was since I decided to take a more dispassionate and open-minded approach to studying the word of God I came to realize that, despite all my years of experience studying last-day events, I still have quite a bit to learn (and unlearn) where the prophecies of Daniel and Revelation is concerned. And to tell you the truth, what I‟ve discovered in my latest research is so frightening I wish I could tell you it will not be so!